The seasonal festive food has been indulged and celebrated. Now it’s the New Year – and time to sweep aside the stodge, eliminate the carbs and lower the fat… So here’s a recipe that’s light, fresh and healthy, but still warming and filling – a warm winter salad. Tips: The salad is also good cold. Make extra and take it to work for lunch. For a vegetarian version, replace the salmon with chickpeas or tofu. 1. Cook the spelt. Follow the instruction on the packet. Drain the spelt when cooked and keep the spelt warm. 2. Cook the vegetables. Cook the broccoli in boiling water for three minutes. Add peas and cook for two minutes more – drain, and keep the vegetables warm. Chop the pepper, chilli, courgette and stir-fry in a little olive oil for 5 minutes until there is a some colour (do not overcook), add the celery and oregano, season with salt and pepper, turn off the heat cover and keep warm. Steam the cabbage for 3 minutes until just tender and drain. 3. Cook the salmon. Cut the salmon into cubes and fry in a little oil, until coloured and just cooked. 4. Make the dressing. Whisk the oil and lemon together. Season with salt and pepper. 5. Assemble and serve the salad. 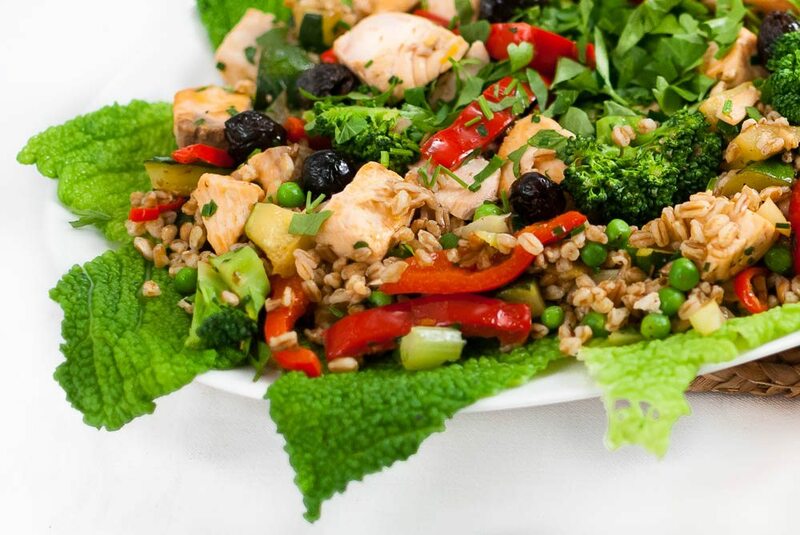 In a large bowl mix the vegetables, fish and spelt. Lay out the cabbage leaves on a platter and arrange the rest of the salad on top. Garnish with plenty of chopped chives and parsley. Serve with the dressing.